Edraw Flowchart ActiveX Control can customize the shape template. You can use Edraw Flowchart Software to create shape templates. Edraw offers you a number of ready-made shapes which you can use in your documents. They are grouped in topical sets as library files. Thus, a library is a collection of shapes usually related to a certain topic (>e.g. basic shapes, flow chart, computer network, etc.). In Edraw, you can customize the existing libraries and create new ones (both by grouping the existing shapes and by adding new ones). 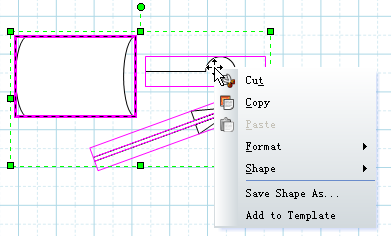 Click the Add Shape Template button on the toolbar or use the Insert / Shape Template menu. The popup menu will show the folder containing the libraries. Click to select the needed template. If the selected template have been opened in the template gallery, the gallery window will switch to the new added template, but not duplicate it. To close a library, call its context menu on its title bar and select the Close command from the menu. You can create a custom shape library by using the New Template command from the Add Shape Template button on the Main toolbar. An empty library box will appear in the library window. Now you can add shapes into it: paste them from other template. Load Template can open an existent template file. For the active library, to set or modify the properties of a template, you can use the context menu on the library's title bar. Sets the selected template to editing state. Close sets the selected template. Export template saves selected template as a template file. Icons and Names shows both the icon and name of shapes. Icon Only shows icon of shape. Names Only shows the name of shape. To manage the template shapes, you can click a shape in a template and call its context menu. When the selected template is in edit state , Cut command is active, otherwise disable. You can cut the current selected shape and paste it to other template or other position of current template. Click Add Shape, a dialog will popup. You can add a new shape to the current template. Note: You must input the name of shape item, the value is necessary. Tooltip is the context help of shaping item. You must select a shape item file, the format is *.ede. How to create a *.ede format file? 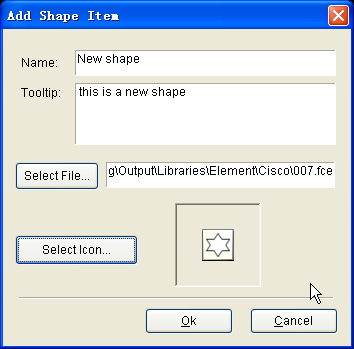 Whenever you can save a selected shape or multiply shapes as a new ede file using Save Shape As command in the context menu of shape. Click Modify Shape, a dialog will popup. You can modify an existent shape's name, tooltip ,icon, and *.ede file. Click Delete Shape, you can delete current selected shape.